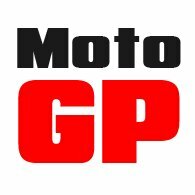 2019 is the first year in which the new CE regulations for motorcycle gear will start to bite. Which is why Halvarssons is replacing a number of its existing models with slightly updated versions. The new Celtic suit is just such a case, replacing and updating the outgoing Discovery jacket with its matching Dede pant. The new suit, as was the case with the outgoing one, packs in just about every piece of technology the Swedish maker has at its disposal. 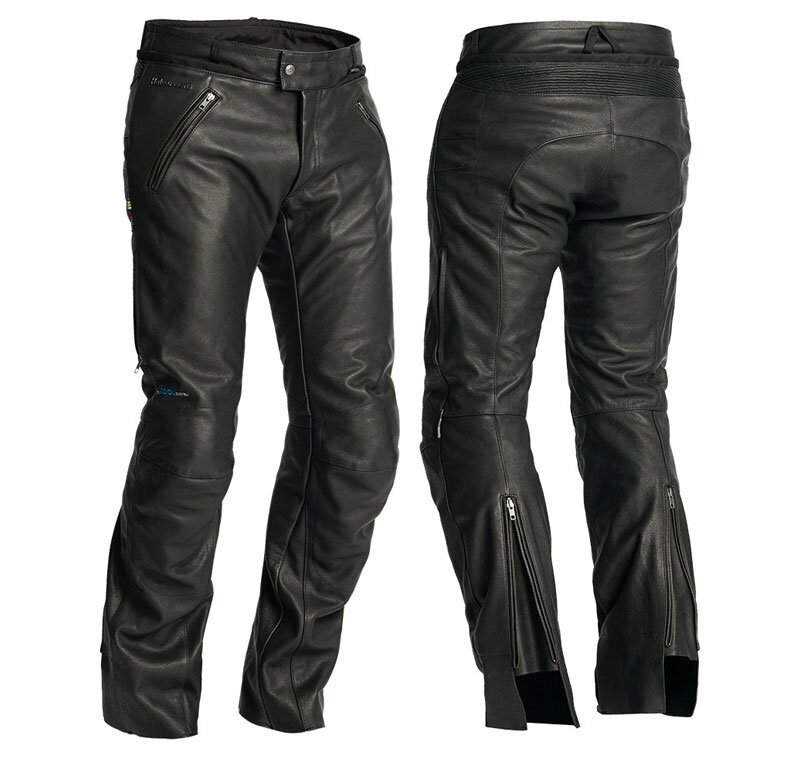 The chassis of the jacket and pants is a softened cowhide that has been treated for water repellency. Now obviously if staying dry was your only, or even your most important, consideration you would not ride in leather, but the Celtic is going to be a much better suit to ride in when it’s raining than most leather suits. That’s not really because of the treatment to the leather, but more because the suit has a full Dryway waterproof membrane. Dryway is a membrane developed by Halvarssons in Scandinavia. It is, in some conditions, superior to Gore-Tex. They use it across their range of products, and there’s no doubt that, even in heavy and prolonged rain, the Celtic will keep you dry. But, in truth, only up to a certain point. And that’s because in heavy rain, leather will absorb the water like a sponge. In fact, imagine a chamois, car washing leather. The water absorbed by the leather will seep into the garment. You may not get wet, but over a period of time the jacket will get heavier as it gets soddened with water. It’s not nice riding like this. It’s even worse if the temperature drops, as the wind chill will make the water, and hence the rider, even colder. So don’t buy the Celtic if you spend a lot of time in the rain. That’s not what it’s about. The Celtic has actually been designed for those who will only ride in leather, but who still want to enjoy some protection from the elements. And this the suit will do well. In a couple of hours of rain, you’re still going to stay dry, and you’re going to be so much more comfortable than you would be in an ordinary leather suit that doesn’t have a waterproof membrane. But what makes the Celtic such a special suit is that this is a leather suit that you can wear all year round. For the summer you’ve got venting in the chest and the legs. But with the Celtic, the leather is also treated with TFL Cool that reflects up to 80% of the heat radiated by the sun. 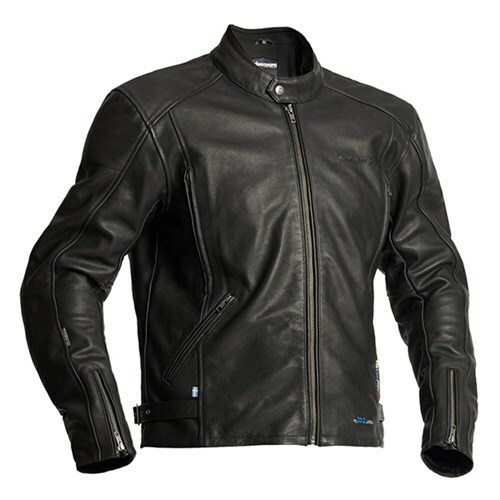 Heat absorption is usually a problem with a black leather jacket, but TFL Cool can reduce the temperature of a garment by up to 20 degrees. For the winter, there’s a full Outlast zip-in liner. But we’d also suggest that the Celtic is one of the safest, most protective suits you’ll ever ride in. The suit is made from cowhide, but in the most crucial areas the leather is backed with Halvarssons’ Hi-Art material that increases the strength of the leather by 200%; that’s three times as strong as leather on its own. The suit also come with Halvarssons’ latest Level 2 armour in the knees, hips, shoulders and elbows. This is one protective suit, so it is perhaps not surprising that it meets the latest CE regulations at the highest AAA level. A back protector does not come as standard, and we have to admit that we are not great fans of the back armour that Halvarssons recommend. It is simply too thick and too heavy. Which is why we have adapted D30’s T8, Level 2 protector with a Velcro strip, so that it will work in the jacket. It’s nicer, lighter, more flexible, every bit as protective; and it’s cheaper. The matching Celtic pants are very similar to the jacket in terms of spec. 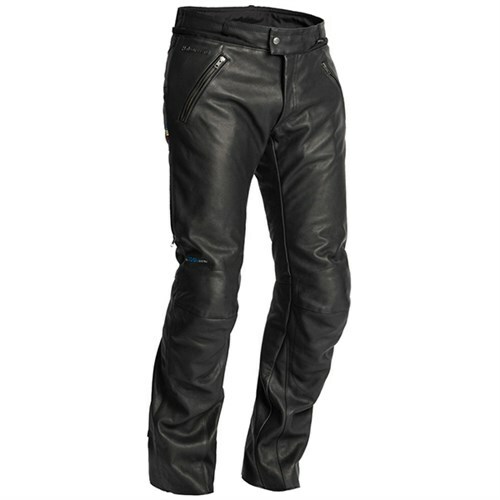 : cowhide, waterproof membrane, venting, Hi-Art anti-abrasion lining, and so on. Of course, they zip into the jacket. 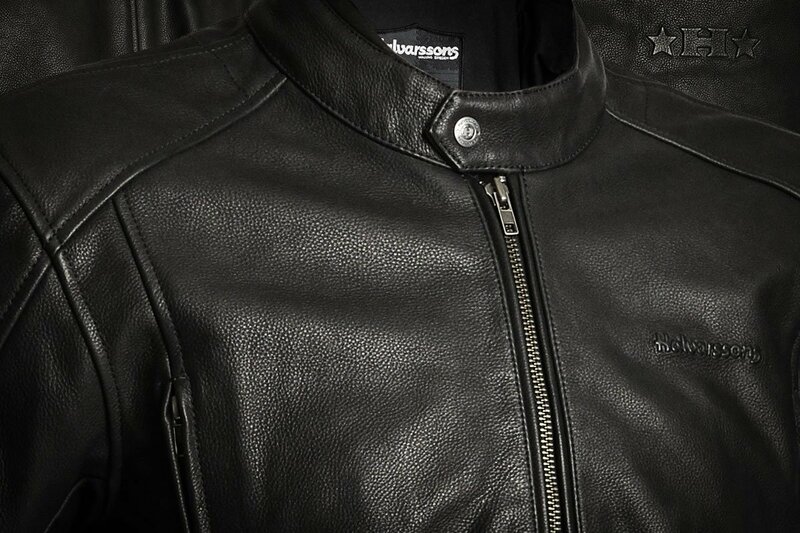 The Celtic is not just your average leather suit. It’s about as high-tech and sophisticated as it gets in the world of leather. We would normally suggest that you only wear leather on warm, but not hot, days, definitely not in the winter, and definitely not in the rain. But whilst a leather suit will never be as adaptable to the conditions as a textile one, the Celtic makes a pretty good fist of it. You can wear it in the cold. You can wear it in the rain, and its venting will make it bearable in the heat. But, of course, and for some this is the most important consideration, the Celtic delivers unbeatable levels of passive protection. 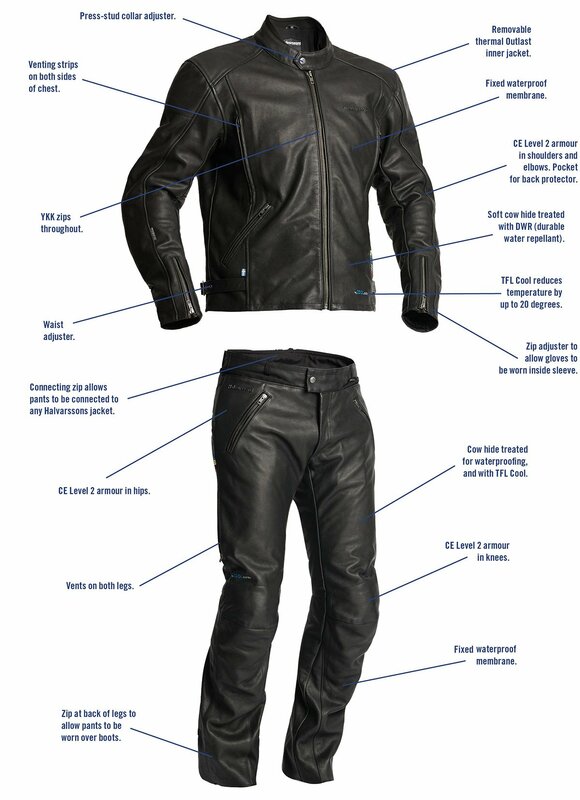 If you’ll only ride in leather, but want a suit that you can ride in all year round, we don’t think there’s a better option out there. Click Halvarssons Celtic to shop the Halvarssons Celtic.